reading the david petraeus chapter was really fascinating in that i was following the events in march 2003 and after. i watched the news and read the news sites and all that came along with it. the politics surrounding the iraq war was astounding. as a nation and congress, we were unified to go into iraq and remove hussein. the "shock and awe" was amazing. then came the "mission accomplished" stunt. then the wheels came off. we were not ready for what came next - the casualties spiked and we did not know how to handle the situation. the democrats who were for the war, were now against the war. bush was trying all he could to stabilize the situation, but no general could do it. many different strategies were tried, but none were effective. the only successful area in iraq was in the north under the command of petraeus. he was "perfect" for the assignment is almost every conceivable way. as vdh put it, "whether consciously or not, david patraeus for two decades had been preparing himself neither for conventional warfare nor for counterterrorist special operations - nor even for classic jungle or rural insurgency. instead, he had prepped for large-scale postbellum occupation and reconstruction in highly urbanized, extremely hostile populations - exactly what iraq would be like in 2003" (p. 224). his plan was to oversee "the reestablishment of everything from the urban university to the city council. petraeus disbursed millions of dollars to more than four thousand projects ('money is ammunition') - often without the oversight of paul bremer, the head of the coalition provisional authority, who had been monitoring civil affairs for the year after may 2003" (p. 225). once put in charge of the whole theater, he implemented his plan throughout the entire country - and it worked. he gained the confidence of the people and they were able to see his vision which enabled them to fight long enough to stabilize iraq. the plan was initiated in 2007; and by december 2011, when all american troops had withdrawn, not one u.s. solider had died. 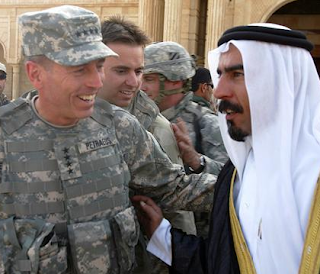 there is a lot more to petraeus' plan than his two-decade preparation and schooling. there had to be a way for the plan to make it to the president's desk so that it could be approved. again, this is where petraeus seemingly shines. vdh describes petreaus as excellent in every imaginable assignment; unmatched intelligence and academic preparation; and ambition. petreaus developed "strong personal friendships with high-ranking officers, all the while showcasing his organizational and intellectual skills at the company, battalion and brigade level" (p. 222-223). his "rivals" discounted his abilities because of his well-connectedness. but this well-connectedness is what allowed the plan to reach the right ears. the legend of petraeus grows when you read about his two near-death experiences - surviving an accidental bullet to the chest as well as surviving a parachute landing when the parachute did not open. the petreaus chapter reminded me a lot of themistocles and belisarius. all three of them were dynamic and had qualities that only they possessed which allowed them to "save" a war for their leaders. without them, the wars would have been lost. no doubt the situation would be far worse had it not been for petraeus, but it is appearing the violence is now creeping back in barely two years after the u.s. withdrew.